Concentrated soda crystals (3 times as active as traditional water-containing soda crystals) in a kraft paper bag. Can be used for many different purposes throughout your home. 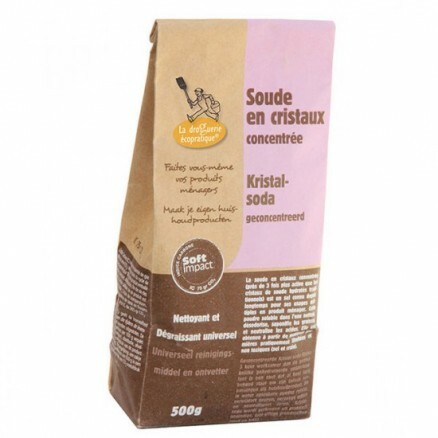 Concentrated soda crystals (almost three times as active as traditional water-containing soda crystals) in a kraft paper bag. Soda crystals have been used for a long time and for different purposes at home. This powder is soluble in water. It cleans, removes odours, saponifies grease and neutralises acids. Its alkaline pH allows the neutralisation of acidity and removes any greasy stains. It can also be used to clean enamel surfaces (bathtub, toilet, washbasins, etc. ), marble or to clear blocked pipes (build-ups made of organic material). These crystals can also be used in order to clean heavily soiled surfaces (a bin, oven door, toilet, fridge, etc.). Its softening property intensifies the efficiency of cleaning agents (laundry detergents, washing up liquids). For DIY uses, soda crystals make wallpaper and paint stripping easier. – Manufactured and packaging in Western Europe. – Made out of common raw materials (chalk, salt).